One thing I love is finding fab local independent businesses. I think its important to buy local when you can and where I live there are so many fab independent shops, cafe's and restaurants. I had heard that a new shop had opened in town recently called The Farmer's Kitchen. 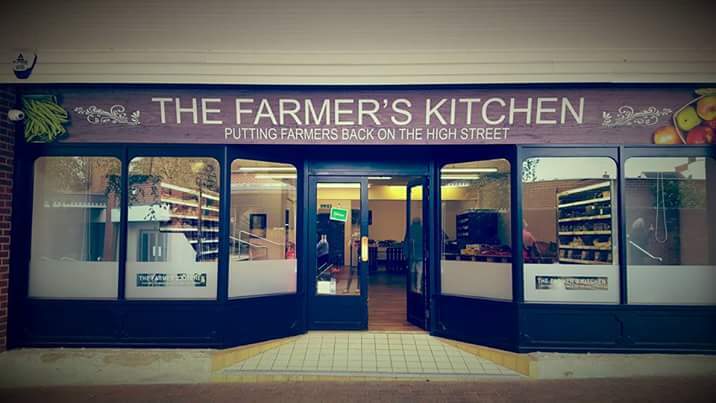 I knew I had to check it out as I love the idea of a shop that sells local produce. So when we were in town the other day I popped in to have a browse and ended up picking up a meal deal each for Stuart and I to have that evening. We were very impressed with what the shop sells as along with these frozen ready meals they also sell a selection of frozen vegetables, fresh meat, fresh fruit and eggs as well as a few other bits and bobs. The shop has a good selection of the ready meals for the meal deal. The deal is £3.50 per meal and you choose a main, a vegetable side and a potato side. Price wise to some people this maybe on the pricey side but if you factor in going out for a meal it will most likely cost you more. Stuart chose to go for a buffalo burger with Moroccan vegetables and parmentier potatoes which you can see below. For my meal I chose to go for the Lamb stew with garlic mushrooms and the parmentier potatoes. We both loved the meals we had chosen and were very impressed. First of all even though they are frozen ready meals they taste so fresh and I can only assume they were made quite recent. The meals are to be oven cooked only rather than microwaved which I also liked about them as these days its more convenient to warm meals up in the microwave so its nice to use the oven more. Overall both Stuart and I agree that we will shop their again in the future and will definitely be picking up some of the meat that they sell. Do you love shopping locally? I love to shop locally. You can find something really different that makes a nice change :) I love the look of his meal, yummy!! I love to shop locally and this is just the sort of place I love! That sounds like really good value & the meals looked real tasty. Yes I do. We shop in our local farm shops a lot. It's brilliant to promote local businesses. Sounds like good value for money and great quality! The meals look delicious and I love the convenience factor of them. It's always good to support local businesses. These meals look gorgeous. I love shopping local as the sales team always know everything about the products unlike in large supermarkets! I completely agree, it's so important to support small businesses especially in today's financial climate! The meal looks amazing too.